Webmail Users: User access to certain 'Options' is controlled by the Administrator. If you cannot see an 'option' in your webmail view - check with your Administrator to see if it has been enabled in your account. 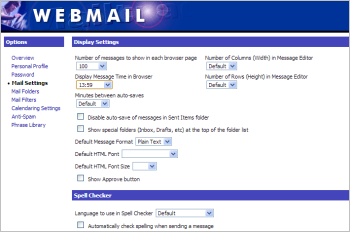 The Webmail Options page has a number of sections to allow the User to control numerous aspects of how their webmail works - access to the Options is controlled from the Webmail Admin page. Set User's current time zone. Note the importance of selecting the accurate location as Mailtraq uses this information to calculate the DST (daylight savings time) rules. -5:00 Bogota is not the same as -5:00 Eastern as the DST rule is different. DST errors can result in Events showing at unexpected times in shared calendars. Enable the Autoresponder to automatically respond to incoming mail with custom text. Read more about Autoresponder or Out of Office response in Mailbox Services. Enables the mailbox to automatically forward copies on incoming mail to the email addresses specified. Profiles are generally remembered from email to email, so a sender will be 'jane' or 'john' until they change. Profile changes should be applied before starting a new email, or relpying to an email. Remember to apply the [Save changes] button at the bottom of the page. Create and manage multiple folders to for mail sorting. Folders can be 'nested' to form logical groups. Message Filters are used to automatically move incoming mail into the appropriate folders. Filters are applied in order, and only the first filter that matches is used. and that Contain or do not contain specified text. and then automatically sorted into Mail Folders. Filters may be run on selected mailboxes at any time. Shared and Additional Calendars to display in the main calendar. Additional calendars and shared calendars are set from the main Mailtraq Console. These settings are available if enabled in the Admin page of Webmail. Select a shared anti-spam database, or use '.' to use the personal database. The Phrase library is a CRM Messaging feature that enables an unlimited number of user-created phrases, or short sections of text, to be stored for insertion into the body of an email. Stored phrases can be used to ensure consistency of response in Sales and Customer Support situations and provide increased productivity by allowing speedy replies in common or repeating situations.